You are here: Home / Magnificent Magnesium! After having my first baby two years ago I found myself very tired and moody and she was such a good sleeper that I didn’t have her to blame. I visited my chiropractor and she went on and on about the importance of magnesium for both men and women and tried to send me home with a supplement. I believe in trying to obtain the nutrients our bodies need through our food so I passed and researched foods I could pay strong attention to that were high in magnesium. She was correct, magnesium is very important to our health and has some super powers when it comes to helping our bodies control blood sugars and blood pressure, inflammation, and is even used to help treat hormonal changes like PMS/menopause, anxiety, depression, and insomnia. A benefit to being a pescatarian is that fish provides a great source of magnesium, but so do nuts and seeds. Well then, pass me some”magnesium” or “nuts”. 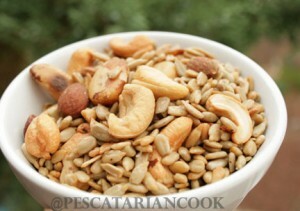 I create this high in magnesium nut blend and portion it out into 1/4 C. portions for snacking on during the week.